Ever think that some books are just too big? Too heavy to hold, too many recipes - to the extent that the good recipes don't stand out? 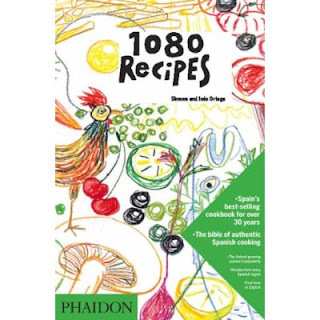 I initially had that reaction to all those Phaidon books - Silver Spoon, I Know How To Cook, Vefa's Kitchen - and 1080 Recipes, the Spanish book by Simone and Ines Ortega. I've had a bit of a rethink though. I was having a browse through the other day (looking for octopus recipes) and realised that actually, 1080 Recipes is a very good book indeed. Georgous design (that goes without saying as it's Phaidon) as well as strong, squiggly illustrations from Javier Mariscal, but the recipes are also much, much better than I originally thought. This makes me happy, as Amazon tells me I bought it back in 2007 (it's now selling for a minimum price of £50 on that site. Wow.) and I've finally got round to using it. Reading it properly now, there are just so many things that I want to cook. The book is fearless in its inclusion of delightfully retro dishes including lots of ways with aspic (yes, deeply unpopular for years, but now becoming very chic again thanks, in part I think to Bob Bob Ricard), savoury eclairs, such as one stuffed with asparagus and mayonnaise, and infinite uses for bechamel - from jambon croquettes (my preference is for the brown shrimp variety, but that's a small point), to chicory gratin, an excellent section on vegetables with everything given due consideration - eight recipes for the lowly cauliflower and plenty for some of my favourites, including broad beans (broad beans with black pudding. Yes!) and swiss chard. Also, how often do you see ingredients like borage cropping up in your cookery books? It does here -there's a recipe for potatoes cooked with borage, garlic and paprika (you have to scrape the hairs from the stalks first). Of course, I'm not sure I want to make *everything* - beetroot stuffed with rice is probably not high on my list of must cooks, neither is the cold rice with canned tuna and mayonnaise, but generally it's a book which I am very impressed with. I particularly like the egg and fish sections (the latter not just merely an homage to salt cod). and the over all thoroughness. It is one of the few books which bothers to give the odd pressure cooker instruction where relevent (such as for octopus). I also like the few recipes from Spanish chefs, including our own Jose Pizarro and Sam and Sam Clark (Moro). Anyway, back to the chicory, which starts with an amazing tip: if you put chicory into a pan with salted water, bring it to the boil, and as soon as the water is boiling, transfer the chicory to another pan of boiling, salted water, it will help prevent bitterness. I wish I'd known this 2 weeks ago when I made a chicory soup which was just over the edge for me in terms of bitterness. So - allow 2 heads per person. Cook whole, as described above, just simmer until tender (the recipe says 20 minutes - no way! More like 10). Meanwhile, make a bechamel. I do not need to tell you how to do this - I always heat up the milk first and infuse with bay, a clove studded onion, mace, peppercorns. Rub butter over an oven friendly gratin dish. Wrap the chicory heads in ham (I like to spread mustard over the ham first) and arrange in the gratin dish. Smother the whole in the bechamel, sprinkle with cheese (I usually stick to cheddar, the recipe recommends gruyere) and cook under a grill until brown and bubbling. Love reading recipe book reviews. I don't have this one and yet now I want it! Love the tip on chicory. I often find it slightly overly bitter.. so I shall try it. Hi. Love your blog but see you haven't posted for a while... Any plans to carry on? Thanks! Yes, I am going to carry on - I've just finished writing my own cookery book, which meant that over the past few months I haven't really had a chance to cook from anyone else's. Anyway, the book is now with the publisher, so I'm about to start up again. Thanks for asking.